What’s the Difference Between Desktop and Professional Printers? The device you use to print your mapquest directions has more going on inside it that you’d give it credit for—in fact, it’s practically a miracle. What goes on inside one, and what’s different about professional printers? There are many different ways to create prints besides your basic inkjet printer. Look through this basic primer on printing, including the inner workings of basic types of printers, both consumer and professional level. 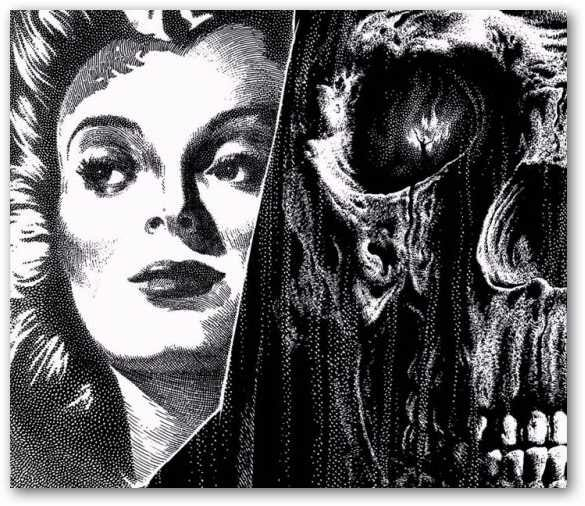 In order to create tints and shades, prints often contain some sort of optically blended tone created by tiny dots of ink, similar to the optical black-and-white blends created by the illustrator Virgil Finlay, above. Similar to how Virgil created shades of gray with simple blacks and whites, tones are created from primary inks, with dense groupings of dots creating darker tones, and light groupings of dots creating light tones. With many modern, very high-resolution printers and printing methods, these dots are nearly invisible, giving the illusion of smooth, continuous tones. 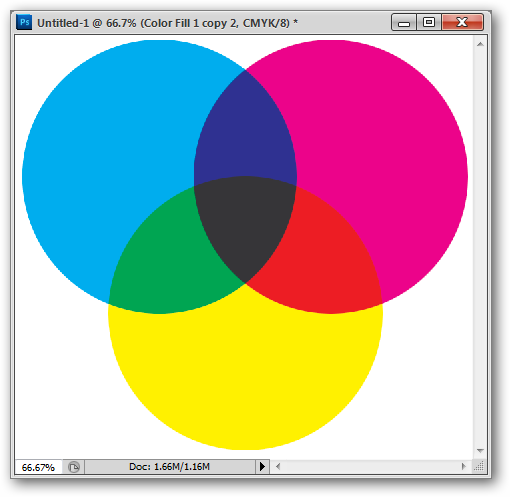 While any color of ink can be printed, the so-called “primary” colors of printing are Cyan, Magenta, and Yellow. 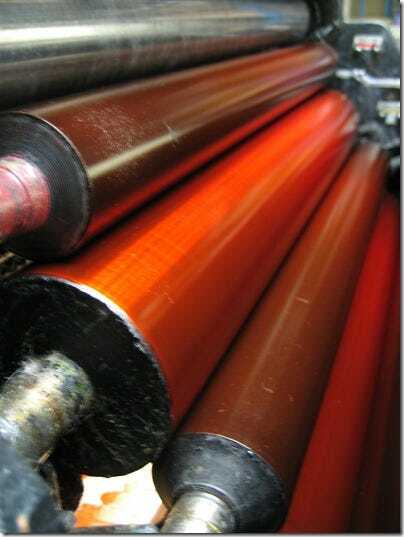 These colors, often called “process colors,” mix to create a broad color range for paper printing. In addition to Cyan, Magenta, and Yellow, Black (also known as Key, or Keyline) is a fourth common primary ink, as it allows printers to tint and shade colors without having to go to the trouble of creating a mixed black, illustrated above in the center. 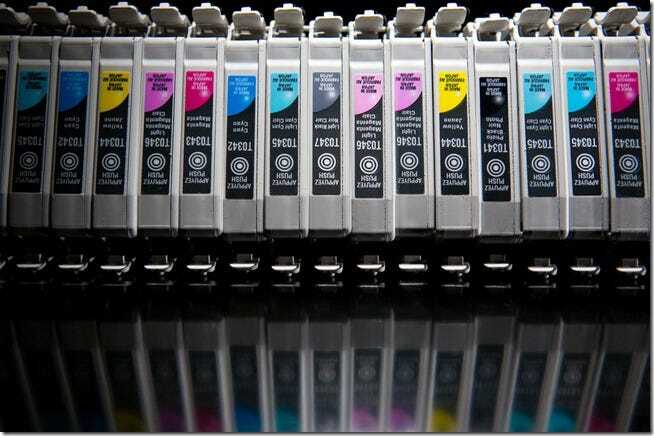 Also known as a gamut, the color range CMYK inks have can recreate, with a fair degree of accuracy, photographs and many other kinds of artwork. While many colors can be created with using CMYK inks, there are limitations to printing with a selection of four primaries. No desktop printer is likely to accurately print a fluorescent ink, or accurately reproduce a photograph of said fluorescent ink. Because the printing inks in CMYK models blend to create secondary colors, the result is necessarily duller than the original primaries. Therefore, colors like fluorescents are known as “out of gamut,” or out of the color space possible by the CMYK method. Coincidentally, monitors and image files also have color gamuts, created by similar methods. While the range of colors are somewhat different as they are based on different primary colors, you’ll find the same sorts of colors appearing as “out of gamut” again and again as they’re all limited in similar ways. The aim of printing is the same, whether the medium is a multimillion-dollar offset lithography press or a humble potato. 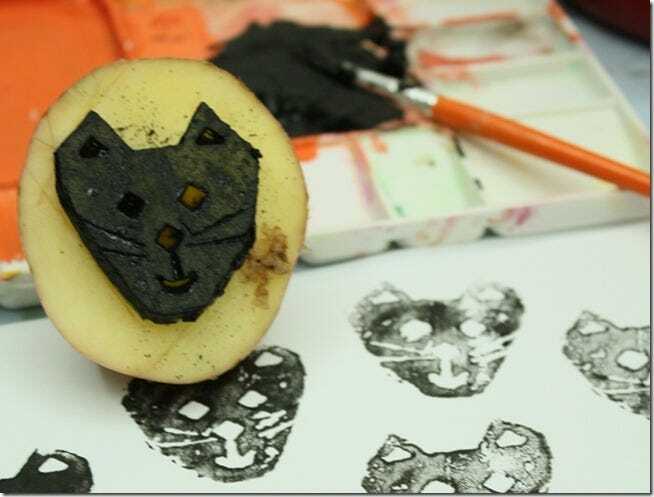 The basic idea is to use some medium to transfer ink or pigment to some sort of medium, or substrate. Ideally, you’ll want to create multiple copies, thereby offsetting the time invested in the initial setup. Once you have your tools to create your prints, you create impressions on your chosen substrate, again, using any medium you choose, potato or not. Throughout the history of printing, this has always been the model, although it can look very different in medium to medium. Let’s take a few minutes to understand some of the different ways prints are made. While they are the everyman’s introduction to printing, many viable methods of printing have simpler means of creating an image—it’s actually quite complex and miraculous that desktop printers work at all. Both Inkjet and LaserJet printers employ the CMYK method and are limited to that particular color gamut. There are exceptions, with some more elaborate photo printers going to the trouble of including additional colors like light Cyans and light Magentas. This increases the number of colors, allowing for more subtlety in prints, and more range in light and dark colors. Theoretically, desktop printers could include an unlimited number or inks, filling in all the gaps in the color gamut, but this would likely be a tough sell for consumers, even if it could print fluorescent inks. Rather than creating a stencil, stamp, or plate, Inkjet printers rely on the computer to track the position of ink nozzles, which spray tiny microdroplets of ink in various sizes and in various densities, creating tones of said colors on papers. With the nozzles moving horizontally across the page, rollers inside the printer move a gripped page vertically in sync with the print head. 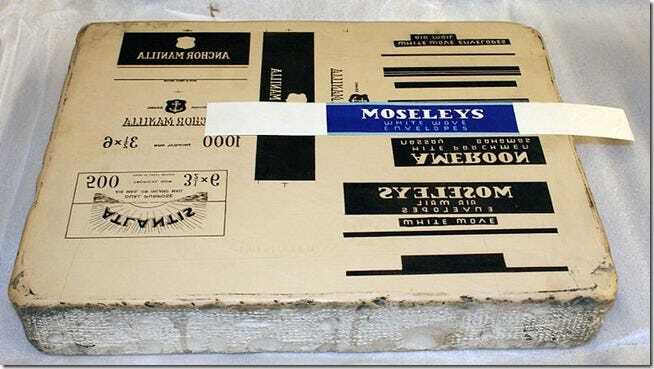 The nozzles are capable of firing thousands of dots as the printhead glides over the paper, and, miraculously, the computer is capable of tracking the entire thing, creating pixel perfect reproductions of the art or photographs sent to the hundred-dollar USB peripheral. Because the inks are sprayed onto the paper, they are necessarily liquid. This has various weak points, as moisture can warp papers, and wet inks tend to smear. 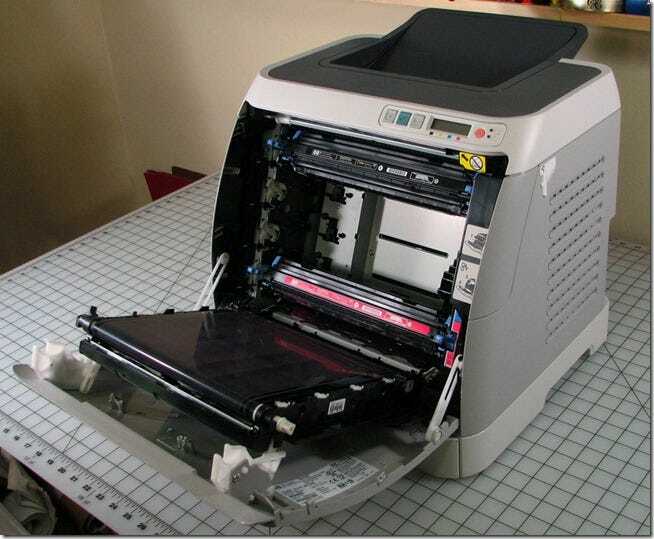 There are, however, dry methods for desktop printing, such as Laser printers. While their process is somewhat harder to understand, Laser printers are fascinating machines, with processes that date back as far as 1778. It wasn’t until the early 20th century that it was combined with photography, and even then it was not quite ready for production printing on any sort of large scale. Laser printers use a process called Xerography, which uses static electricity and physics to create images. This graphic created by Wikipedia user Yzmo does an excellent job of explaining the basic ideas behind Xerography. 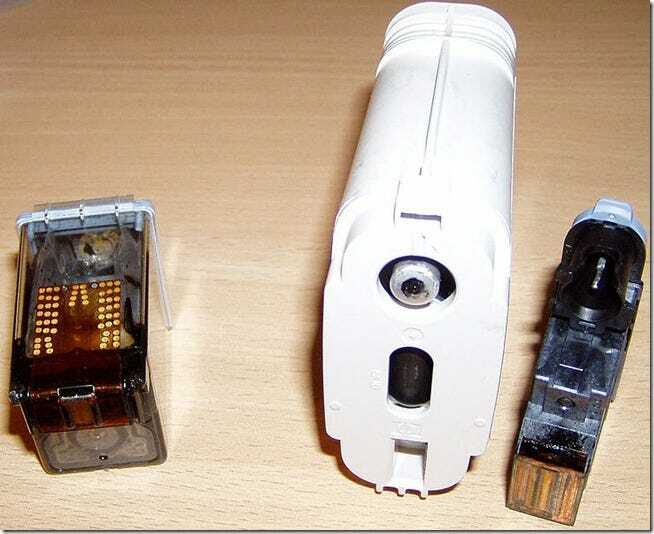 You may have seen round, cylindrical drums inside your laser printers. One of these drums is charged with an electric current until it carries an overall charge, illustrated in point (1.) 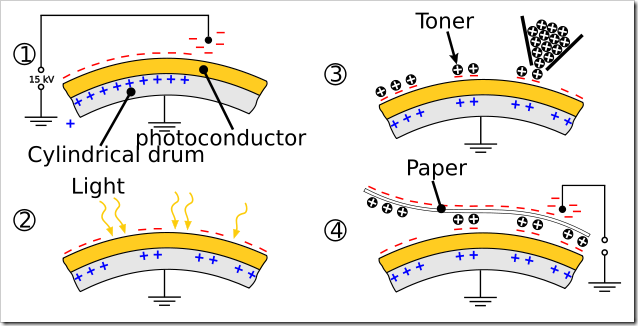 Light reacts with the charged areas of the drum, removing the charge from the areas where it was hit by the focused light, or the case of laser printers, a literal laser, as seen in point (2.) At this point, a sort of stencil has been drawn by the laser beam on the rotating cylinder, and the printer dusts said cylinder with toner particles with the opposite charge, as in point (3.) The opposite charges attract and stick to one another, until they are run over a paper substrate with a charge to attract the toner, creating an impression of the image, as in (4.) Science! While employing the same basic ideas as other types of printing, Lithography, often known as “Offset” printing, creates images with machines that are simultaneously more and less complicated than your standard desktop printer. 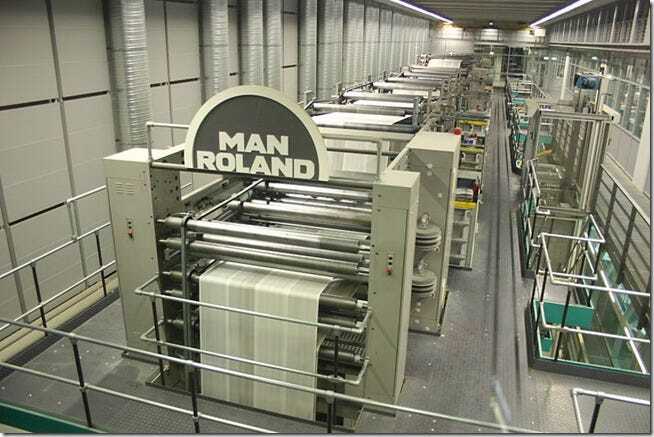 Much of the world’s printing is done on Lithography presses, including most newspapers, magazines, books, and most mass-produced print media. One of the major advantages of offset printing is the ability to use colors outside of the process color CMYK gamut. 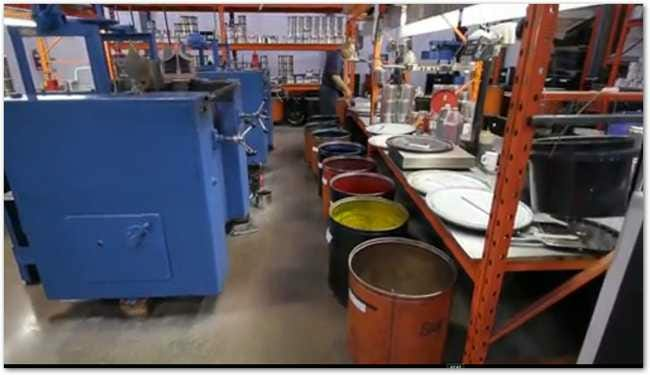 Any ink that can be created that is appropriate for offset printing (most inks are exclusive to a type of printing). This means that fluorescent colors, impossible with Laser printers and Inkjets, are possible with lithography. Let’s briefly take a look at how and why that is. 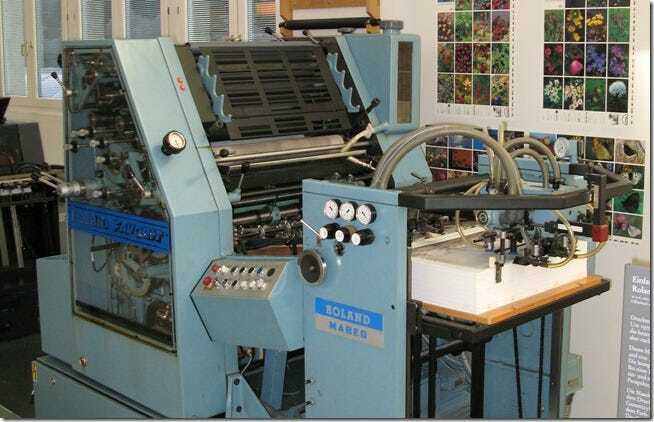 Similar to the rollers and method used in Xerography, Litho presses use wrapped photographic plates, one per color, to print images. The plates have two basic areas, with ink being repelled by hydrophilic (water-loving) areas and adhering to hydrophobic (water-fearing) areas—these hydrophobic areas creating your printable image areas. The illustration above should show more clearly the difference in the hydrophobic and hydrophilic areas, as the black areas are the inked hydrophobic areas. This is an old-fashioned litho stone, similar to one of the ones Alois Senefelder would have used when he created the method in 1796. Modern offset presses do not use lithography stones, but rather metal plates with similar hydrophobic/hydrophilic properties. Because of this plate-per color style of printing, a printer can have specific colors beyond the CMYK set. As long as a specific press has the stations to add multiple plates, any number of colors can be added, allowing for those out of gamut colors. However, as colors are added, the difficulty in printing an image rises. What you see in the image illustrated above is paper in long rolls, whizzing by at speeds so fast the camera captures as blurs, with multiple stations, each with plates, stretching into the distance. With every station, papers have a tendency to stretch lengthwise, as they are pressed between rollers, oftentimes creating images with the hallmark “out of alignment” look where colors do not line up as they were intended. While a great many publishers are moving toward an e-book market, it’s pretty clear from the continued rapid production of not only books, but also paper products by the millions, that print is far from dead. 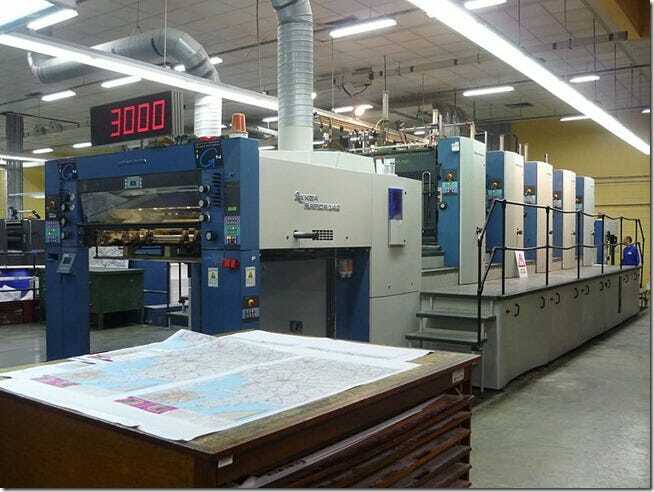 While many antiquated methods of delivering information are suffering from advances in technology (read: newspapers), many are improved by new technologies that improve the look and quality of prints. We’ll likely see interesting innovations in printing in the next several years, with more products like Inkjets and Laser printers for end-users, and professional presses capable of things older printers wouldn’t have ever dreamt of.